Jeff Adney of Prime Coat Coating Systems recently wrote an excellent two-part Pet Boarding & Daycare article about kennel floor choices (which includes veterinary kennel floor plans). If you missed Part 1, you’ll want to review how the right choice of materials can stand up to years of daily traffic in a busy veterinary practice. Jeff explained that there are many factors to consider when choosing your D.R.E.A.M. floor: (D)urability, (R)eturn on investment, (E)nvironmentally friendly, (A)esthetics, and (M)aintenance. From this it was concluded that the best floor option meeting all five of these attributes was resinous/epoxy-based coatings. Now, in Part 2 of his post, Jeff recommends the best ways to purchase and install your resinous kennel flooring for lasting performance. It is now time to examine what is needed to ensure that your resinous D.R.E.A.M. floor is installed successfully. A resinous coating is defined as a proportioned combination of polymer products when installed on a properly prepared substrate, the mixed and cured components penetrate into the existing substrate to become a monolithic, non-porous wear surface. So let’s talk about the S.M.A.R.T. way to ensure a good quality resinous floor and the key ingredients needed for an installation that will perform for many years. Specification, Safety and Specialized equipment. (S)pecification. Having a proper Specification is very important and will include a detailed description of the work to be done, how it will be installed and the materials to be used in a project. This is the building block for ensuring the right type of floor coating system selected is appropriate and will meet the demands of your boarding and/or daycare facility. Typically an architect will provide the specification based on your input but also on their years of experience in a particular market. I have found it is money well spent to work with an Architect that specializes in animal care facilities in that he will help ensure the right products are being specified based on past performance and experience. A small list of factors that are considered when putting together a flooring specification should include: aesthetics, installation parameters, functionality, clean-ability and economics (budget constraints). (S)pecialized equipment and proper (S)afety equipment are also key S’s to a S.M.A.R.T. quality installation. Does your installation company have the right equipment? Preparing a concrete substrate to receive resinous coatings is no small undertaking and specialized preparatory equipment will be needed. 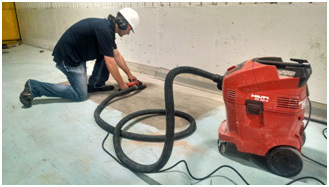 The most common types of equipment to prepare concrete surfaces are diamond grinding machines and centrifugal wheel blasters (i.e. shot blasters). Is your installation team prepared to operate this equipment as well as use the proper eye, ear, respiratory and work attire? A professional installation team will understand the need to protect not only themselves but others as well from the potential risks when operating the equipment. Although preparation equipment is typically hooked to large industrial vacuums to contain the dust, it is difficult to completely contain 100% of the dust. Is a temporary wall needed for containment reasons? A few of the risks associated with preparation techniques include noise related issues, airborne contaminants, flying debris, as well as electrical shock. Hiring a company that owns their preparation equipment (not rental), follows a regular maintenance schedule and having trained installers to safely operate the equipment is vital. (M)anufacturer support and (M)aterials are the two key M’s we will now discuss. For a vast majority of the resinous coatings industry, the manufacturing company is separate from the installation company. This has both pros and cons with cons far out weighing the pros. Materials differ from manufacturer to manufacturer. Some manufacturers have certain specialty products, but will also make a whole line of generalized products just to be able to compete on all projects when their “industry specific” lines slow-down. What manufacturing companies are being specified for your facility? Does this manufacturer offer products specifically for your facility demands, or are they just all-purpose “me-too” products? Next, consider this scenario: An installation company is buying certain products from one manufacturer today, but tomorrow the same installation company is buying similar products from a different manufacturer. The installation team most likely will be at a disadvantage when it comes to installing these products because they don’t use them consistently. Although possibly similar chemistry, the varying products from various manufacturers may have very different installation techniques, mix ratios, viscosities, cure rates etc. etc. If an installation company is always changing whom they buy the materials from, how will they ever truly get good at installing certain manufacturers’ materials? There is also the risk an installation company may make up their own system. They may use base components from one manufacturer and subsequent coatings from another. Although this is bad business practice, we often see it done in an effort by an installation company to save some money or as a way to use up left over materials from previous jobs. If an installation company is always changing whom they buy from, where does the loyalty from the manufacturer lie? How willing is the manufacturer going to be to support the installation company if something should go wrong? Will there be finger pointing with you stuck in the middle? When working through a manufacturer that specifies, but does not install, the question then becomes – who does the work? How do you find “approved installers” of the materials manufacturer? Does the manufacturer find them for you? What is the basis for whom they choose? Is it location, price, favoritism? Maybe it’s an installation company that this manufacturer is trying to bring on board and brings them the job in an effort to win their future business. All these scenarios do not put you in a position to receive the best possible installation. Working with a national company that installs the products they manufacture gives you the best possible opportunity to receive a quality installation that is backed 100% for both material and labor. (A)ppearance. The final appearance of the floor surface is more important than many people may believe. An owner’s thinking on how the floor is going to look versus the final outcome is sometimes quite different. It is important to understand exactly what you are buying. Make sure you spend time discussing appearance, gloss, textures and how the floor transitions to other types of flooring. Is there a custom design you are looking to achieve? Don’t hesitate to request physical samples of your floor choice and make sure you sign off on both color and texture. Is a different texture required for each area, or will the entire floor have the same texture? Remember, the beauty of resinous coating is that texture can be adjusted on demand. Try to make time to visit facilities that have the type of floor that you or your architect is specifying. Talk to the owners of that facility. Talk to the staff that maintains it. Be candid and express to your flooring contractor any concerns you might have after the site visit. If visiting the jobs is not feasible, then make the investment in having a mock-up installed at your facility for the agreed upon floor choice. How well informed was the sales person? How well did he/she stay in touch before, during and after the installation? Did you run into any issues? If yes, where they resolved to your satisfaction. How long has the floor been in use? Are you completely satisfied with the installation? What do you do to maintain the floor? References can also come from parties that are not the end users. Talk to your vendors. Find out whom they know in the industry. Who do they see at the various trade shows? Chances are the current companies you purchase supplies, equipment and incidentals from know the companies that understand your business and can help with introductions. (T)iming and (T)esting. Timing is critical when it comes to having a properly installed resinous floor. Typically on new construction projects; resinous flooring will be one of the last things done. The building needs to be closed up, walls erected, proper lighting installed and HVAC up and running. When installing resinous coatings, a climate controlled facility and having the project area free of all other trades from beginning of preparation to final cure is a must. Concrete must be hard and properly cured with a proper vapor barrier installed underneath. Most resinous coatings need to be installed with a concrete moisture reading below 5% and relative humidity below 75%. Is the installation company you hired capable of performing these tests before he begins work? Does he know the importance of moisture and relative humidity testing? When considering remodeling of your current facility, working through logistics is extremely important. Let’s face it – down time equates to loss of revenue. A competent professional installation company will know prep times, installation and cure times (factoring in ambient and surface temperature) and be able to work with you to provide a detailed schedule minimizing downtime. That company should also have a foreman on site with the proper number of trained installers to keep project on schedule. Remember to keep in mind that it is also wise to plan for the possibility of unforeseen delays. Be prepared to look at your calendar and previous history of bookings to determine the best time for the remodel. Plan, schedule, commit and then execute. So there we have it. The S.M.A.R.T. way to ensure a successful installation of your D.R.E.A.M. floor!